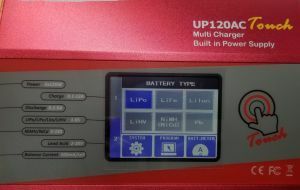 The UP120AC Touch Charger is a Duo AC/DC charger with Touch Screen. 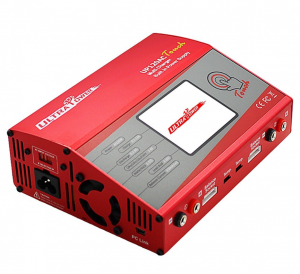 120 watt power per output and Each channel is capable of charging all types batteries. Unit includes 2 sets of fans to cool the system, these are controlled by an internal sensor for fan speed. 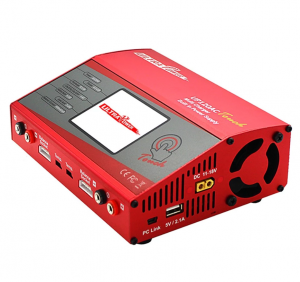 Internal cell balancers, touch screen display and important warning and safety function, it can also be used as a power supply to power other devices, up to 300Watts. Multi color screen helps to quickly show which battery is being viewed by displaying each channel in a different color. See pictures 3 & 4. 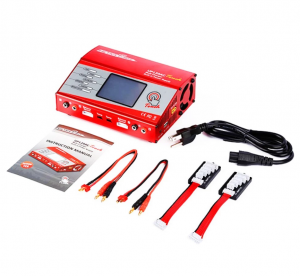 Automatically controls current rate during charging and discharging process. Two independent balancing ports for lithium batteries. Five user customizable pre-set per output. Two fan cooling system with internal sensor for controlling fan speed. 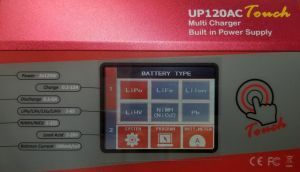 Batteries can be set to automatically Charge/Discharge or Discharge/Charge up to a maximum of 10 cycles. 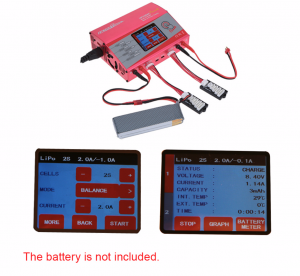 PC-based program can analyze the characteristics of each battery via a USB port, graph of voltage, current and capacity curves with individual voltage of each cell in a lithium pack can be displayed on a PC- *PC-LINK USB adapter is required and must be purchased separately. 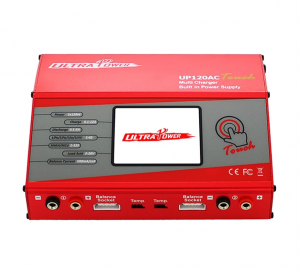 Two USB ports, 5 volts, 2100mA total for iPad, mobile phone, digital cameras, etc.